Louis-Jacques-Mandé Daguerre was a French artist and scientist who claimed a place in history by inventing the Daguerreotype - the first practical and popular system of photography. Daguerre was born in Cormeilles-en-Parisis, France on 18 November, 1787 and died 10 July, 1851, in Bry-sur-Marne. In his early career, Daguerre had been a tax man, and a operatic scenery painter. From 1822, with Charles-Marie Bouton, Daguerre had been running an exhibition known as the Diorama. The Diorama showed huge (~14x22 metres) paintings of places and events, which were combined with lighting effects, 3D models and real objects to produce spectacular illusions of realism. Daguerre had been making his initial studies for paintings by using a Camera Obscura and experimenting with methods of recording the image, but without much effect. In 1826, interested in improving production of his Dioramas and experimenting himself to develop a photographic process based on flourescent materials, he visited the Parisian opticians Vincent and Charles Chevalier, renowned makers of camera obscuras for artists, who gave him the address of Joseph Nicéphore Niépce - the inventor who had made the first permanent photographic images. For a few years, Daguerre had to correspond with Niépce, until finally in 1829 the shy Niépce agreed to a partnership for work on a photographic process, after Niépce had visited Daguerre and after hopes to become rich with another invention died with the death of Niépce's brother, the co-inventor of their boat-motor. Together with Daguerre Niépce developed a better variant of his process, based on lavender oil as light-sensitive agent and reducing exposure times from several to one days, still not what they both wanted to achieve. From then each of them worked alone. Daguerre started his attempts with silver jodide on metal plates. In 1833 Niépce died, and his place was taken by his son, Isidore. All further advances to create a better process were achieved by Daguerre. First he discovered that the latent image on an exposed silver-plated surface coated with silver iodide could be developed by mercury vapour. By 1837 he found that the image could be made permanent after washing in a salt solution. 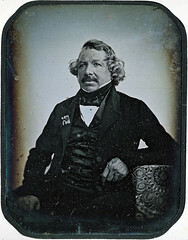 With the agreement of Isidore Niépce, Daguerre named the process after himself, the Daguerreotype. In 1838 they wanted to found a stock market company. As "Roadshow" Daguerre organized a series of public events where he photographed renowned Parisian buldings, developed the images and showed them to the astounded people. But after a half year no investor was found for the company Daguerre-Niépce. 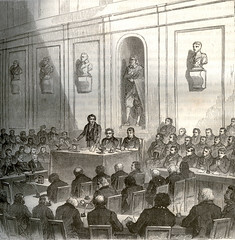 Daguerre contacted professor Dominique François Arago of the French Academy of Sciences who immediately founded a commission including Alexander von Humboldt, Jean Baptiste Biot and himself to evaluate the invention. On 9 January 1839, a description of the Daguerreotype process was announced at a meeting of the Academy of Sciences. 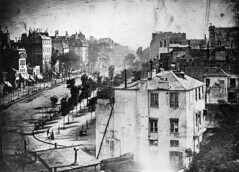 In June 1839, the French Government were given the rights to the Daguerreotype and Niépce's Heliograph processes in return for Daguerre and Isidore Niépce being awarded, respectively, pensions of yearly 6,000 and 4,000 francs. Daguerre was also appointed officer of the Légion d'honneur. On 19 August 1839, the Government published details, giving the process "free to the World" - with the exception of Great Britain and its colonies, where a patent had been granted (No.1839-8194) on the 14th, five days before the publication. The patent meant that a royalty was payable for use of it in the British Empire; this both inhibited use of the Daguerreotype and encouraged evolution of other processes. The announcement and the publishing of the invention by the French government brought a world-wide attention for it. It was the first time that an invention immediately made world-wide news. The first cameras were already developed before the announced publication, and Fox Talbot reacted by publishing his process. Other photography pioneers presented their approaches, too, for example Carl August von Steinheil with Franz von Kobell in Germany, and Hippolyte Bayard in Paris even wanted to be acknowledged as one of the inventors of photography. 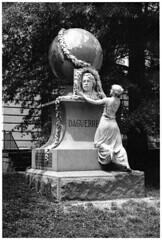 Daguerre wrote a best-selling pamphlet - Historical and Descriptive Account of the Various Processes of the Daguerreotype and the Diorama. This went through many editions, and translations into other languages appeared through late 1839. His process spread rapidly across most of the globe. He went on to design a wooden camera Le Daguerreotype - to be made by Alphonse Giroux and developed into a series of similar cameras. A second production license for the camera was given in 1839 to the Susse brothers who also published the original French edition of Daguerre's booklet "Historique et description des procédés du Daguerréotype et du Diorama" in the same year. The English rights to make Daguerreotypes were bought for £150 per annum by businessman Richard Beard, and in June of 1841 he obtained outright Daguerre's patent rights in England. Beard opened London's first studio on 23 March 1841 on the roof of the Royal Polytechnic Institution (now the University of Westminster) in Regent Street, London. Beard became immensely rich on proceeds from this and later studios and his patent rights. A second London studio was opened very shortly after Beard's, by Antoine Claudet on the roof of the Royal Adelaide Gallery, off the Strand. Claudet had purchased a license directly from Daguerre, in conflict with Beard's. It is reported that many early English Daguerreotypes do not show the name of the photographer, as a number were using the process without paying any license fee or royalties. It was Beard who employed various people to improve his business; one of these was J G Goddard, who discovered that adding Bromine to the sensitization process greatly improved the speed of the Daguerreotype plates. Wills, Camfied & Dierdre Wills, History of Photography - Techniques and Equipment, Hamlyn, 1980. This page was last edited on 5 March 2018, at 11:40.